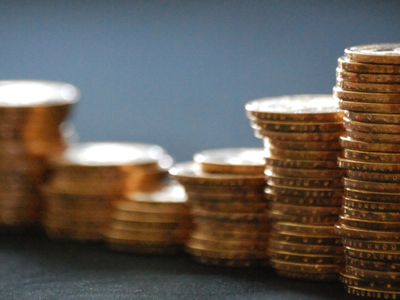 Our new website, MarottaOnMoney.com, helps us share wealth management ideas more frequently. We also comment on some of the financial planning literature that the average investor doesn’t have time to read. I highly recommend subscribing to our weekly email updates. He said, “Morningstar weighed in with a comprehensive study on dollar-weighted versus time-weighted returns. They calculated the 1-, 3-, 5- and 10-year time-weighted returns and dollar-weighted returns through 2009 for open-end mutual funds based in the United States. A time-weighted return is measured by how the fund performed with the dollars it had. It weights each time period equally as though someone remained invested continuously. A dollar-weighted return looks at the inflows and outflows of the fund. It puts a greater weight on the periods when people had more money in the fund and less weight when they had less money in the fund. Simply put, investors did not experience the full return of the fund because they moved into the fund after it went up and moved out after it went down. By trying to chase returns, their portfolio underperformed the very funds they were invested in by about 1.5%. So if investment advisors simply dissuade clients from chasing returns and moving in and out of what might otherwise be good funds, they may earn their fee and then some. This is just one benefit of a disciplined approach to investing. Financial advisors perform a service when they dissuade people from impulsive decisions that feel right emotionally but statistically are a bad idea. The average investor puts money into funds that have done well and takes money out of funds that have done poorly. Using recent past performance to pick investment vehicles often means buying high and selling low. This is one reason that the average mutual fund holding period is three years or about one typical market cycle. Changing funds that frequently is a poor investment philosophy. You should select funds because they represent an asset class you want in your allocation for the long term. Then you should pick a fund that tracks the index well and has extremely low expense ratios. Investors who choose funds based on recent past performance often keep inferior funds simply because the market is rising. Or they drop superior funds just because the market has corrected. Make the decision to select a specific asset class based on the long-term characteristics of that subset of stocks. Size, style, sector or country are all possible characteristics you may choose to over- or underweight. Having made the long-term asset allocation, find the fund that best tracks that index for the lowest cost and stick with it. If you are confident about your long-term asset allocation and one of your selections underperforms the rest of your portfolio, respond by rebalancing your holdings. As a result, you will buy more of what has gone down. Normally an expected investment return is selected by the expected real return versus the expected risk as measured by the standard deviation. Portfolios on the “efficient frontier” offer the highest possible expected return for a given amount of risk or volatility. Many investors do not understand the boundaries of the efficient frontier. They are unrealistic, expecting portfolios to have a higher return for a lower risk than is possible. Unfortunately, many investment products are so laden with fees and expenses that including them in your asset allocation results in an inefficient portfolio. Excessive fees drag your performance down without reducing your volatility. For example, the gone-fishing portfolio I recommended in previous columns has an expense ratio of only 0.27%. The average mutual fund has an expense ratio about 1% higher, which is inefficient. And inefficient investments clearly cannot produce portfolios on the efficient frontier. In the typical efficient frontier, stocks return about 6.5% over inflation and bonds return about 3.0% over inflation. These long-term averages have been measured over two centuries of data. Although we look at these statistics when building a portfolio, any given year–or even decade–produces unique risk-return data. On average if you want an annual standard deviation of only 6%, you have to settle for an expected real return of about 3%. If you want a real return closer to 6.5%, you will have to tolerate volatility of close to 20%. This is the classic risk-return curve for a one-year investment horizon. Although few investors have a one-year investment horizon, we all experience the markets one year at a time. In fact, we experience the markets one day at a time, and some days it seems like the sky is falling. Although recently the Dow has dropped precipitously, it began in December 2010 at 11,050. Unduly concerned investors are measuring returns from the high-water marks, not even from levels as long as a year ago. This typical psychology affects even the most seasoned investors. The only antidote for such emotional reactions is to adhere to a disciplined investment strategy designed to maximize returns over a specific time horizon. And that’s where Blanchett’s study can help. 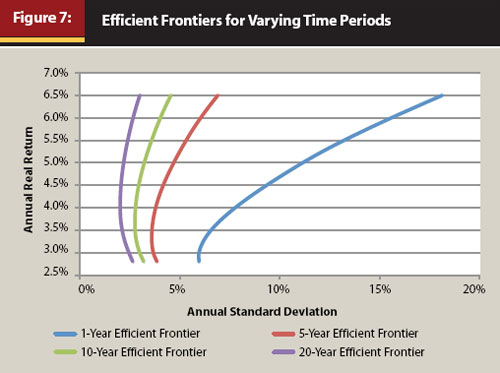 In addition to charting the one-year efficient frontier, he also charted the 5-, 10- and 20-year efficient frontiers. His work confirms that different portfolios make sense over different time periods. Aiming for a 6.5% real return for one year requires enduring higher risk. The 5-, 10- and 20-year efficient frontiers reduce the risk considerably. Over longer periods of time, returns tend to revert to the mean. We use these statistics when suggesting that clients put the next five to seven years of spending rates in cash and bonds and invest the remainder of their portfolio in equities. Dividing the portfolio in this way provides enough stable investments for the next several years along with sufficient appreciation for long-term financial health. Thus it allows clients the best chance to sleep well tonight and still eat well in 10 years. One client, who is a bridge master, made the analogy that in bridge you have imperfect information. But you are always playing the odds, which is always the right decision, even if it turns out to be wrong in one particular hand. Investing is very much like that. It is never a mistake to have a balanced portfolio and to select investment vehicles with low expense ratios. But asset allocation also means you will always have something to complain about. If you don’t have an asset allocation of low-expense investments on the efficient frontier, get one. Nothing is more important. And if you have such a game plan, don’t let short-term fluctuations in the market deter you from a brilliant long-term strategy. Link posted with permission by the Financial Planning Association, Journal of Financial Planning, “Incorporating Time into the Efficient Frontier” by David M. Blanchett. For more information on the Financial Planning Association, please visit www.fpanet.org or call 1-800-322-4237.